How did three black brothers from Detroit form potentially the world’s first punk band in 1973 and nobody ever knew about it? There’s a great and unspoken conspiracy theory threaded into the homespun family-centric narrative of the surprisingly feel-good documentary A Band Called Death. But, first, the story, as recounted by directors Mark Christopher Corvino and Jeff Howlett, who let the band members tell the story at their own pace against an attic’s worth of faded photos and rusty-sounding audio tracks. There were four Hackney brothers who grew up in the still-thriving Detroit in the 1960s and '70s. Three of them (David, Bobby, and Dannis) fused the spirituality of their Baptist preacher father and their mother’s love for music by creating a band that broke boundaries as well as their neighbors’ eardrums. Being black kids in the home of Motown, they started out playing R&B as the beautifully and all-inclusively monikered Rock Fire Funk Express. But then Alice Cooper and The Who came to town, and David, their guitarist/singer and driving force, decided that rock was going to be it. Based on some fuzzy theological musings, he renamed the band Death and soon the sounds coming out of the Hackneys' spare bedroom was driving everybody crazy with that "white boy music." Scrappy, snarly, epic in scope, and burnt with intensity, Death sounded like nothing else on the planet in 1973 and '74. It was as though they had incorporated all the energy and vision of the greatest bands of the time and distilled it down to the most pure and raw elements of rock and roll, with all the arena-style fripperies scraped away. In other words, at a time when largely white rock audiences were still obsessing over Pete Townshend's guitar solos and black audiences (at least in the Hackneys’ neighborhood) were listening to Philadelphia-style R&B like Earth, Wind, and Fire, Death was playing punk rock. But almost nobody knew about this, because after recording some songs at Detroit studio Groovesville where Funkadelic and The Dramatics were also recording, Death failed to interest any labels in what they were doing. There were just too many barriers for a hidebound industry to overcome: the name, the music, and their race (the latter being particularly confusing when tied to what they were playing). According to the film, though, one of the people Groovesville was able to convince to listen to the Death tape was industry legend Clive Davis. The story goes that Davis liked what he heard but wouldn't consider looking at the band until they changed their name. David, a headstrong artist who saw doing that as akin to selling his soul, refused. The ebullient Dannis and Bobby — whose present-day stockier and dreadlocked selves provide the heart of this very warm and human piece of filmmaking — remember thinking that they didn't care what the name was: they just wanted to get a contract and play. Also, the Hackney brothers (a powerfully loving and well-adjusted bunch for the most part, if this film is to be trusted) say that they abided by their father's dictum to always "back up your brother." So if David wanted to call the band Death, they would be called Death, no matter what. Bit by bit, the band drifted away, David fell into alcoholism, while Dannis and Bobby moved away, found jobs, and eventually started playing together in one of those reggae bands that can always be counted on to fill out the lineup at college outdoor music fests. Hauntingly, not long before David succumbed to lung cancer, he pressed the master tapes on Bobby, telling him that one day, somebody would come looking for them. Now, here's the conspiracy theory: What impact did Death’s tape have on all those people who listened to it when Groovesville was sending it around? How is it that Death birthed this potent, spiky offshoot of rock completely on their own two years before The Clash even formed and the Ramones released their first record? Did somebody hear it, get inspired, and start looking for their own (preferably white) band called something less off-putting than Death to deliver the same thing? The London and New York punk scenes fed off each other right from the very start, all of them sprouting at least partially out of that ragged and aggressive proto-punk MC5/Stooges sound coming out of Detroit in the late 1960s and early '70s. Although Corvino and Howlett’s somewhat detail-challenged documentary doesn't mention this, Death apparently only played a few very poorly received gigs around Detroit before giving up the ghost. If there was no record and there were no concerts to spread David Hackney’s musical breakthrough, how come punk started cropping up in cities to the east just after the death of Death? The filmmakers are chary about making broad and hard-to-substantiate claims, leaving that for their (blessedly) short roster of celebrity guests. 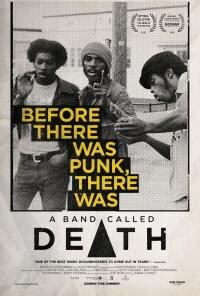 The Roots’ Questlove opines that Death got to punk well before the Ramones, for instance, while Kid Rock pops in to proffer the inarguable position that Death is "badass." 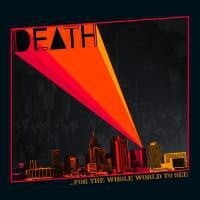 Like last year’s similarly structured Motor City musical redemption story Searching For Sugar Man, A Band Called Death takes its cue from the modesty and joyfulness of its subjects, letting the glory of the music speak for itself. But it's all tinged with more than a hint of tragedy and regret. By the time the film gets around to describing the band's rediscovery by a younger generation of garage-rock and early punk vinyl freaks (gobsmacked that they'd never heard of these guys before), the glow feels well-earned, given its high cost. Whatever the truth of the matter, Death lives.